This digital exhibit recreates Glimpses of the Great War:Faith, Family and Community during World War I, a physical exhibit at DePaul University’s John T. Richardson Library. Glimpses of the Great War opened in April 2017 as a commemoration of the United States April 1917 entry into the Great War. The physical exhibit will be on display until the end of 2017, and is a project of DePaul University Special Collections and Archives. 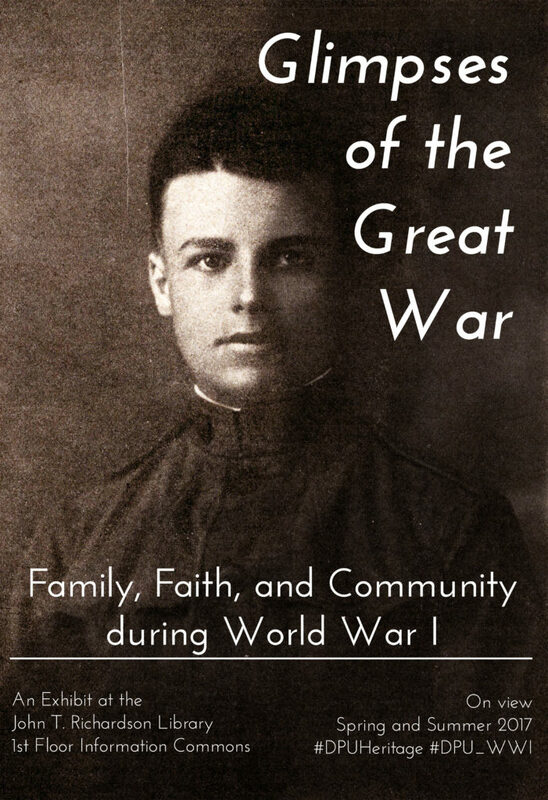 Glimpses of the Great War: Faith, Family and Community during World War I began as a physical exhibit in the John T. Richardson Library at DePaul University’s Lincoln Park campus, opening on April 12, 2017. DePaul University Special Collections and Archives staff developed the exhibit over an 18-month period after a chance discovery. In 2015, university archivist Andrea Bainbridge discovered coverage of a funeral held in late 1921 for a young man killed in France in 1918. The January 1922 Minerval (a DePaul student publication) reported that “a sad echo of the Great War” was heard in St. Vincent’s Church during the funeral of Oliver G. Ward, though it gave no explanation for why three years had passed between Oliver’s death and his funeral. The search for an explanation and proximity to the WWI centennial form the foundation of Glimpses of the Great War. Bainbridge and Lisa Geiger, archives processing assistant, scoured DePaul’s historical student publications and university photographs for the name “Ward.” It quickly became clear that Oliver’s family had deep ties to DePaul University, Chicago’s Lincoln Park neighborhood, and St. Vincent’s parish. DePaul University Special Collections and Archives (SPCA), with historical collections documenting each of these overlapping communities—and the relationships among them—is uniquely able to tell the story of how we arrived at Oliver’s 1921 funeral. Contextual research and resources featured in the exhibit came from all sectors of SPCA’s collections: DePaul University Archives, the DeAndreis-Rosati Memorial Archives, as well as our rare book collection and community archives. We are grateful to the American Battle Monuments Commission and the National Personnel Records Center at the National Archives at St. Louis for helping us piece together Oliver’s final journey from France to the United States. We are also indebted to our library colleague Christine McClure, digital services coordinator, and her student assistant, Gerard Panganiban, for bringing this digital version of Glimpses of the Great War to life. The physical component of Glimpses of the Great War will be on display through the end of 2017 at the John T. Richardson Library at 2350 N Kenmore Ave., Chicago, IL, 60614. The poster advertising Glimpses of the Great War featured an image of Oliver G. Ward, as pictured in the DePaul Minerval. « Previous: Where Do We Go from Here?